The goal of this project is to study the effect of myofiber architecture on wave propagation in human atria using image-based simulations. To investigate this, we use models with subject-specific geometry and fiber orientation constructed from ex vivo diffusion tensor (DT)- MRI scans of human hearts. Progression of mitochondrial network failure is characterized by the increase in extent of depolarizing mitochondria. We used a computational model to investigate how depolarization vulnerability across the network is acquired. 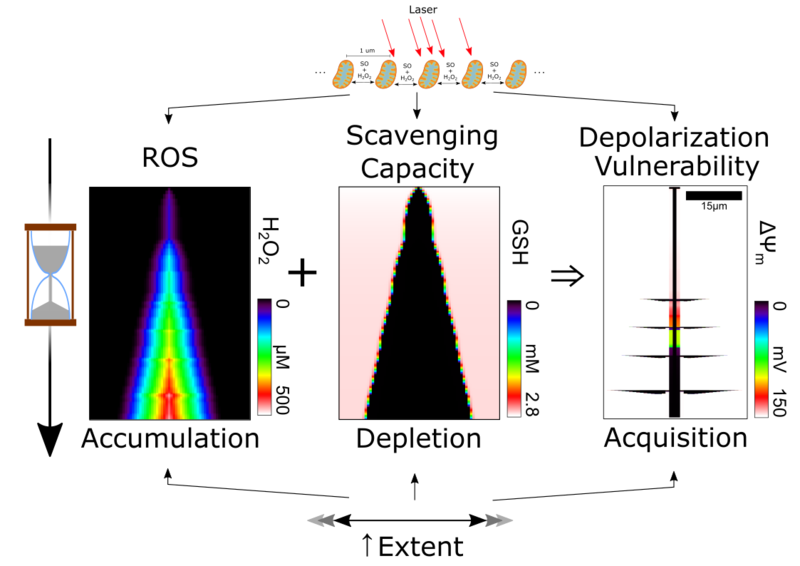 We found that gradual ROS accumulation and scavenging capacity depletion across the network precedes growth of depolarization vulnerability. Further, communication of oxidative stress via the ROS hydrogen peroxide was necessary for these processes to occur. The time course for the transport of hydrogen peroxide and the resulting accumulation/depletion processes determines the time course for the evolution of mitochondrial failure. The goal of this project is to obtain mechanistic understanding of ventricular tachycardia and its relationship to 3D infarct geometry. We use high-resolution MRI-based models to simulate arrhythmias and further correlate them with the underlying infarct architecture. Farhad Pashakhanloo, et al. "Submillimeter diffusion tensor imaging and late gadolinium enhancement cardiovascular magnetic resonance of chronic myocardial infarction." Journal of Cardiovascular Magnetic Resonance 19, no. 1 (2017): 9. This project explores comparison between reentrant driver (RD)-harboring regions identified by electrocardiographic imaging (ECGI), conducted prior to catheter ablation in persistent atrial fibrillation (PsAF) patients, and via simulations conducted in patient-specific computational models reconstructed from late gadolinium-enhanced magnetic resonance imaging (LGE-MRI) scans. Our discovery of atrial regions in which both ECGI and simulations detected RDs suggests that PsAF is at least partially driven by fibrosis-mediated mechanisms. Simulations also identify "latent" RDs – regions within the fibrotic substrate where an RD could persist, but never manifested during clinical mapping. 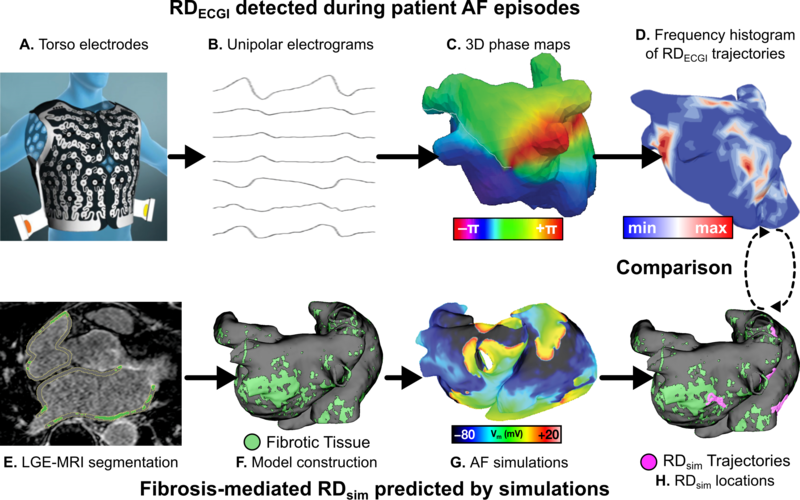 Conversely, RD-harboring regions identified by ECGI but not in simulations indicate that some clinically mapped AF episodes were perpetuated by mechanisms other than the fibrotic substrate. Our retrospective analysis suggests that substrate-based ablation combining simulations with ECGI could improve outcomes. Biophysical simulation of a whole human heart has been driving the forefront of mathematical modeling and computing technology. We are developing electromechanical heart models individualized to image scans of individual patients. 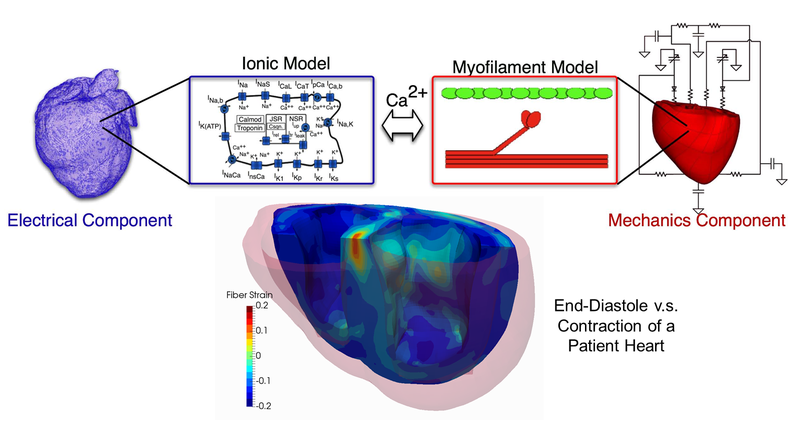 Such heart models incorporate structural, mechanical and electrophysiological remodeling effects associated with myocardial infarction from the molecular level up to the organ level. Our goal is to use this novel computational model to elucidate how myocardial infarction influences dyssynchronous heart failure, and thereby to help doctors improve the efficacy of the current clinical treatment approach, cardiac resynchronization therapy (CRT), which is not effective for 30% of heart failure patients who receive the CRT. Personalized heart models were generated from patients' contrast enhanced MRI scans by extrapolating ventricular geometry over the ICD artifact region; the latter was assumed to not contain infarcted tissue while outside the artifact, tissues were classified as normal, scar, and gray zone based on pixel intensity (Fig line 1). 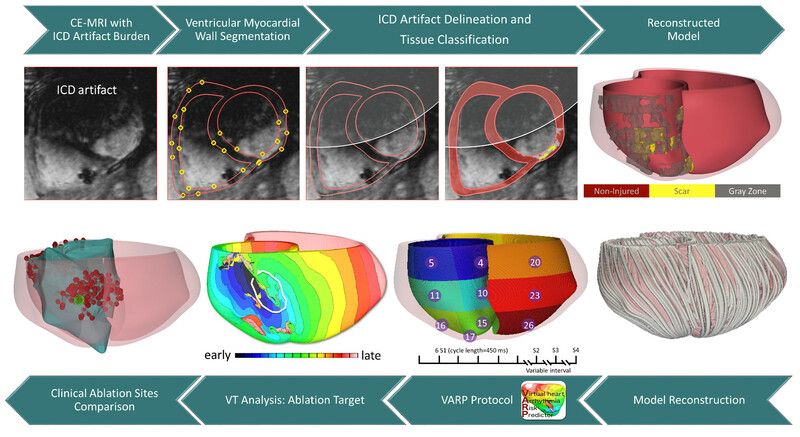 Application of Virtual-heart Arrhythmia Prediction (VARP) protocol from 26 sites induced in silico VT, and VT analysis predicted optimal ablation targets (Fig line 2). These targets coincided with the clinical ablation lesions but were smaller. Personalized ventricular models could accurately predict non-invasively the optimal VT ablation sites where scar was not obscured by ICD artifact, and thus might be used to guide clinical ablation. Accurate knowledge of the heart myofiber architecture is essential for construction of realistic whole heart computer models. 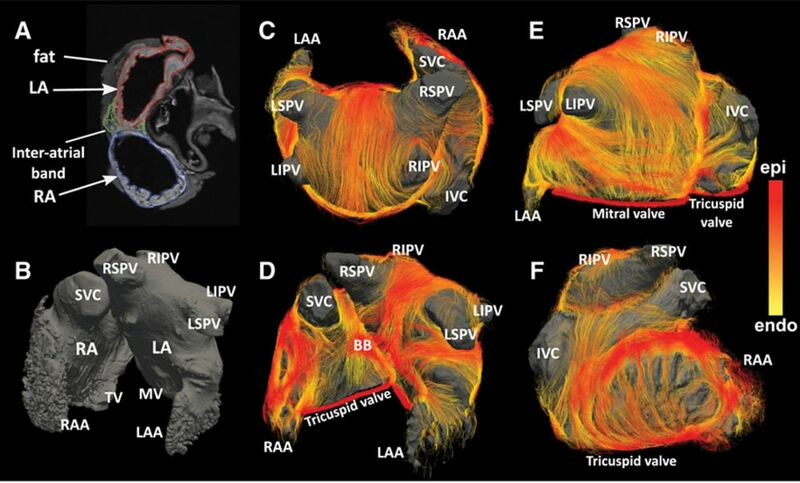 In this project, we use submillimeter diffusion tensor MRI to reconstruct atrial and ventricular fiber organization in health and disease states. The aim of these projects is to investigate the effect of mechanoelectric feedback on contractile function and arrhythmia in diseased human hearts. To do this we develop novel multiscale mathematical models that incorporate strongly coupled ionic and myofilament components as well as disease specific remodeling. Thus far, ischemia, heart failure, and hypertrophic cardiomyopathy are being studied. Cardiac optogenetics is an emerging field that involves the expression of light-sensitive proteins (e.g., Channelrhodopsin-2) in excitable heart cells to enable modulation of their behavior with beams of light instead of conventional electric stimuli. Our lab has led the development of a multiscale computational modeling framework that allows for the many possible uses of this exciting technology to be explored non-invasively. Potential applications range from contact-free assays of cellular excitability to transformational new clinical techniques like light-based defibrillation. The ability to realistically simulate cardiac optogenetics from protein to organ scale has helped identify barriers to translation and findings from modeling have significantly narrowed the scope of in vitro investigations. Boyle, P. M., Karathanos, T. V., & Trayanova, N. A. (2018). Cardiac Optogenetics: 2018. JACC: Clinical Electrophysiology, 4(2), 155–167. Boyle, P. M., Murphy, M. J., Karathanos, T. V., Zahid, S., Blake, R. C., & Trayanova, N. A. (2017). Termination of re-entrant atrial tachycardia via optogenetic stimulation with optimized spatial targeting: insights from computational models. The Journal of Physiology, 596(2).